Bali Activity This is the best trekking tour to visit deep of Bali! Starting from Batukau Temple, on the base of Mount Batukau. Climbing up the path that only local people use, and adventuring in the quiet sacred forest. The first 30 min, until throughout the forest is hard up-hill slope, walking down-hill slope of grass road while listening the guide about many kinds of plants and fruits. It’s 9 km trekking course. If you want to try easier trekking, this one is recommended! So called “paddy = rice field,” walking in the rice terrace of Tabanan which is known as the big granary. 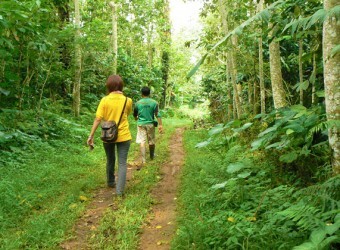 Starting from PADDY ADVENTURE’s restaurant, walking on the path in rice field, and visiting villages around that area. The road doesn’t have up and down, however, you may sweat to walk under the sun… This tour is also to reach Paddy Restaurant as the goal, 8 km trekking course. * In case of rain during the tour, free rental rain court is available. Casual clothes without worry about getting dirty, comfortable shoes, sun lotion, clothes for change, and money, etc. * After trekking, you can use shower. Towels are free rental. * Pick-up time and drop-off time is approximate time. The scheduled time will be informed at the reservation. * PADDY ADVENTURE offers shuttle service. Stopping several hotels in the area, pick-up time might not follow the pick-up schedule. Use APV, etc. car with AC. ・Finish payment, going to WC, etc. ◆Walking beside the stream from Mount Batukau, and in the rice terrace. You can see big and small temples of Hinduism, calm villages, harvesting, planting rice, and so on. 12：30～13：30 Arrive at the goal, Paddy Restaurant! Good job. There is hot shower facility. You can take shower and change clothes. For Paddy Trekking, you can wear casual clothes. You walk under the strong sunshine, it’s recommended to bring sun lotion and hat. For Jungle Trekking, you might walk in the muddy mountain road, so you should wear casual clothes without worry about getting dirty and comfortable shoes. What’s happen if it’s rain? In morning of the day, sponsor decides if they can hold the tour or not. Trekking guides always bring rain courts for sudden rain during trekking. In Paddy Restaurant of PADDY ADVENTURE, please enjoy Indonesian buffet lunch. You can choose 2 drinks (cola, fanta, coffee, ice tea, mineral water) or beer (1 small bottle). In fine weather, you can see Mount Batukau in front. Hot-shower is available. There are shampoo and shower jell in the shower room. I joined trekking to know nature in Bali but I was bitten by insects and mosquito during trekking. I thought that I should have wore long pants when join trekking. I could see various plants, fruits and flowers on jungle trekking. It was my natural experience after a long time. Enjoy fresh ar in the forest. My feeling was also fresh.